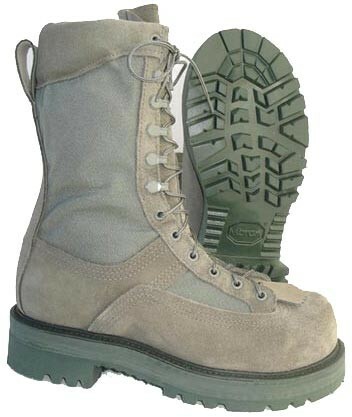 Hoffman Boots has developed the Military Powerline Series based on the Powerline model for military personnel in Sage Green. Waterproof liner that keeps water out while allowing the boot to breathe. Durable Vibram Olympia style sole offers great wear and durability. The upper features 4 generous rows of stitching for durability and solid eyelets and speed laces for easy lacing. Our unique dual steel shank system and double midsoles offer unsurpassed climbing support for climbing. A safety toe meets the ASTM F2413-05 standard and is also Electrical Hazard Approved to ASTM F2412-05 standards. Hoffman Boots was proud to work on this project for the brave men and woman of our armed forces and hope that this series of boots makes your job just a bit easier.